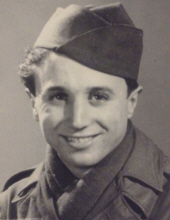 James Orsi (Jim), 95, passed away on February 8, 2019. Jim was born in Chicago, IL on March 7, 1923. Jim served in the United States Army during WWII from February 12, 1943 to December 29, 1945 and later retired from the United States Postal Service after 30 years of service. He enjoyed baseball, football, fishing, camping and being with family. Jim is survived by his wife of 60 years, Edna Orsi; son, Steve; grandson, Greg; granddaughters Elizabeth (David Grundell) and Kristine; great-grandsons, Mason, Owen and nieces; nephews, and other family and friends. A visitation will be held on Thursday, February 21, 2019 from 4pm-7pm with a rosary at 5:30 pm at McCune Garden Chapel. A funeral service will be held at 12 pm, Friday, February 22, at McCune Garden Chapel, 212 Main St, Vacaville. To send flowers or a remembrance gift to the family of James "Jim" Orsi, please visit our Tribute Store. "Email Address" would like to share the life celebration of James "Jim" Orsi. Click on the "link" to go to share a favorite memory or leave a condolence message for the family.